Our company is widely appreciated in the domain of manufacturing and supplying of Stainless Steel Pumps. These Stainless Steel Pumps are constructed from quality stainless steel fabricated from our trustworthy vendors. In addition to this, these are available at reasonable market prices. 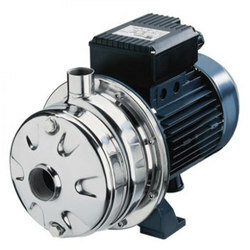 Last but not the least, these pumps are high durable and customized as per our customer requirement. Our company is the renowned manufacturer and supplier of Stainless Steel Pumps. These steel pumps have sturdy construction and are best suitable for dosing and metering duties. These pumps are manufactured by a special bulge forming process to obtain components like pump casting, impeller backplate etc. In addition to this, these are offered at reasonable prices to our dear customers.